Viki here again: Let's talk about joint pain. As someone who was diagnosed with a rare childhood form of hip dysplasia, I know alllll about it. The stiffness and limping that doesn't seem like that big of a deal? That only happens when we are in *A LOT* of pain and we lose range of motion in our joints. Because dogs and cats evolved to hide their pain, you understandably might have no idea that your pet is suffering severe joint pain until you notice a difference in their muscle mass, or their ability to do activities they once did with ease. It's no joke. Thankfully there's something that can help. Most therapeutic regimens call for the supplementation of glucosamine and the use of an anti-inflammatory or steroid - and while that sometimes works or at least reduces the pain a bit, more often than not, the joints get worse and the pain never fully goes away. The problem with glucosamine isn't that it is ineffective, it's that its used alone. Here's where Tri-Acta H.A. comes in. 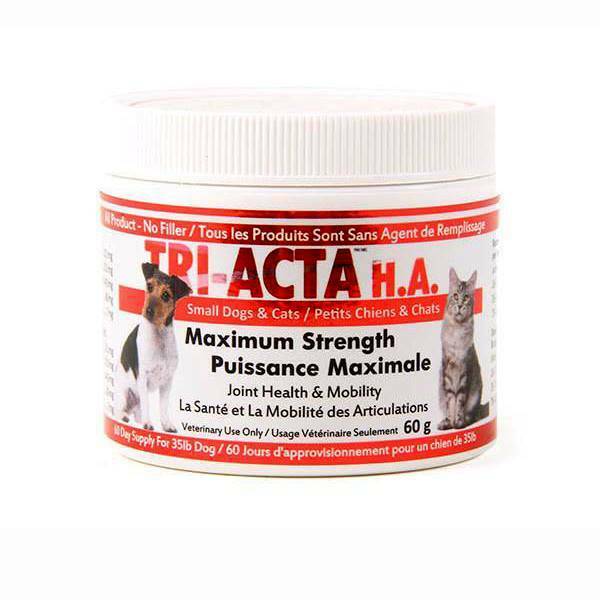 Instead of providing a single supplement, Tri-Acta contains glucosamine, chondroitin, MSM *and* hyaluronic acid. "TRI-ACTA H.A. is used for the treatment of age-related soreness, osteoarthritis, hip dysplasia, significant pain and/or immobility, physical injury or surgery, and is designed to provide maximum protection against deterioration of cartilage while actively working to repair worn out cartilage, reduce pain and inflammation and improve the viscosity of synovial fluid." I swear to you, the testimonials we have received and continue to receive from customers have been nothing short of amazing. Used consistently, some people see noticeable differences in as little as TWO WEEKS. As in "oh wow, my cat is jumping on the table again!" and "holy smokes, my dog is RUNNING again! he hasn't done that in months!". I have never seen a product like it before. Swing by and we'll be more than happy to tell you more about it.